Last weekend, John’s dad was coming over for dinner and I wanted to make an appetizer that was relatively healthy with whatever we had on hand. After scouring the kitchen for a half hour, I realized I still had a bunch of organic sweet potatoes to use up from our awesome CSA at Middle Branch Farm. I decided to turn them into baked sweet potato fries and serve them with a homemade olive oil based mayonnaise seasoned with smoked paprika. The combination was AWESOME. Everyone liked them. In fact, it was hard to snap a picture of them without someone’s hand digging in the basket and the pic above is the best I could get. Haha! If you want your “fries” to stay crispy, don’t pile them all up in a basket when serving like I did. The smoked paprika mayo is perfect for these and you’ll have plenty of mayo leftover to use for other things during the week (try it on scrambled eggs or steamed kale – OMG!). Once you start making your own mayo, you’ll never go back to store bought ever again, I swear! And making it with olive oil is so much better for you than the junk that goes into commercial mayo. Try these and let me know what you think! Preheat the oven to 425 degrees. Lightly grease two large cookie sheets. 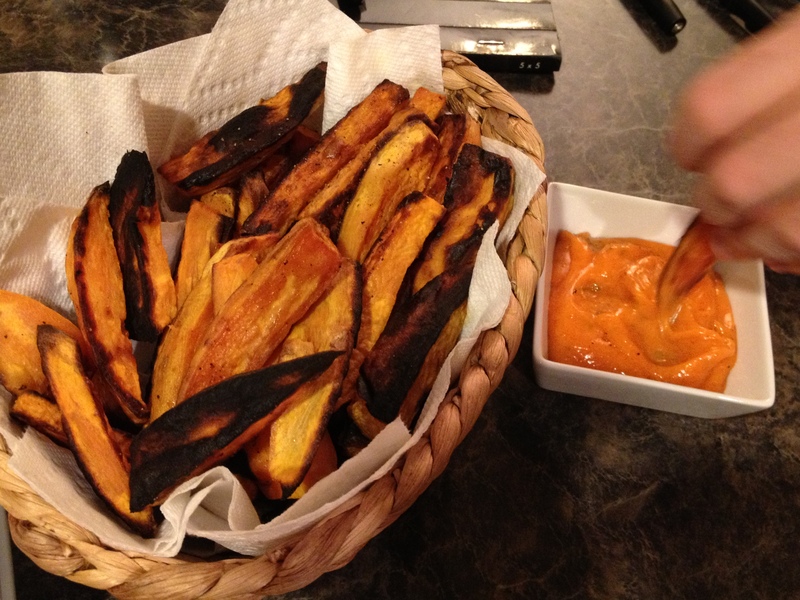 Slice sweet potatoes into 1/2 inch thick fries. It doesn’t have to be exact but you want them to be close to the same thickness so they cook at the same rate. Toss sweet potatoes in the 2 tablespoons of oil, sprinkle with a little salt and pepper and then spread the sweet potatoes onto the two prepared cookie sheets but don’t let them touch each other! The fries need to be spaced apart. You may need to use three cookie sheets to accomplish this. If the fries are touching, you’ll end up with steamy, soft fries and that’s not what you want! Bake for 15 minutes, flip and bake for another 15 minutes more or until cooked through on the inside and browned on the outside. Serve with the smoked paprika mayo (below) or ketchup. optional: a dash of fresh lemon juice or hot sauce for a little zing! Whisk the 2 egg yolks with the dijon mustard until they are evenly blended. Slowly add the olive oil by pouring it down the side of the bowl in a very thin stream and continue whisking the entire time. Don’t use extra virgin olive oil here because the flavor would over power the mayo. If you pour the olive oil in too fast, you will break the emulsion so go slow with the pour and whisk like your life depends on it! Pour it slower than you think you need to. Once you’ve whisked in all of the oil and you have a thick creamy mayo, add in your seasonings: shallots, tarragon, smoked paprika, salt, pepper and optional, a little lemon juice or hot sauce. Make the mayo an hour before serving for best flavor. *Eating raw egg can pose some health risks to those with compromised immune systems. Pastured eggs have a lower risk than commercial eggs of carrying salmonella but there is still some risk. Eat at your own discretion. Tune in tomorrow for Day 1 of my healthy tip filled campaign called 31 Days of Healthy Ways to Enjoy the Holidays More. This entry was posted in Dairy Free, Gluten Free, Recipes, Tree nut and Peanut free and tagged dairy free, gluten free, nutfree, recipes, Sweet potato on November 30, 2013 by Andrea Quigley Maynard.